By the time we bear witness to Cher’s three incarnations battling out one more internal struggle with zingers like, “We don’t leave you,” and “We are you! You need us!” — you may feel like screaming “Snap out of it!” — the GIF-worthy line from the star’s Oscar-winning performance in Moonstruck. There’s so much ground to cover — from the absence of a paternal role model in her early years to her tumultuous relationship with husband and business partner Sonny Bono (Jerrod Spector) to her foray into theater and film — that all of the time Cher spends talking to herself as Star (Stephanie J. Block), Lady (Teal Wicks) and Babe (Micaela Diamond) might be better utilized in deepening the relationships with those who impacted her life. I imagine most theatergoers will be forgiving of Rick Elice’s book (Jersey Boys), which still offers plenty of punchy one-liners delivered with a lip-licking head snap for which the icon is known. 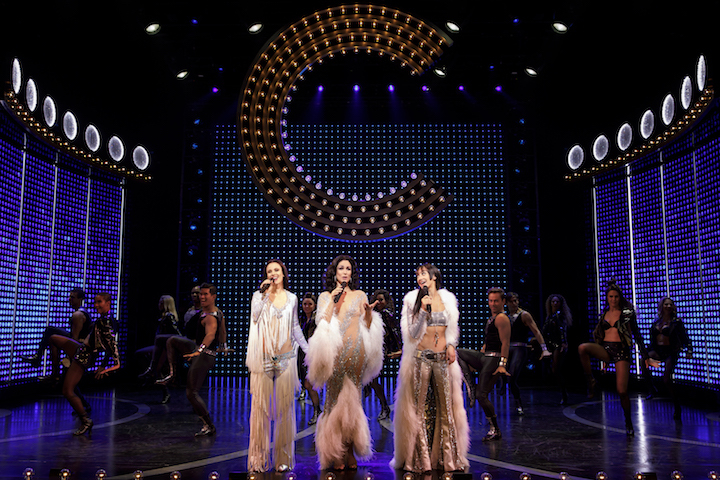 Unlike Summer: The Donna Summer Musical (scheduled to close on December 30 after a nine-month run), The Cher Show rarely takes itself too seriously, but when it does, the musical offers a captivating glance into Cher’s evolution from shy outsider to multi-faceted star.